There is something in spiral stairs . People used to really have fun building them... 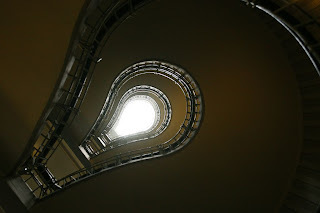 This one is in historic cubist-style building in Prague (now Czech Cubism Museum), a.k.a. �Black Madonna House �. Somehow my conversion from RAW to TIFF to JPEG doesn't carry along EXIF data. This is shot at ISO 1600, 1/60, f/4, Canon 5D with 28-70L zoom at 35mm.